The biggest and rowdiest hype in recent months has been Employees Only (EO), an offshoot of the famous New York bar. Once brimming with opium dens in the 1800s, Amoy Street has emerged to be one of the most bustling streets on our little island in the last two years. If you’re looking for a drink after work, or a fancy cocktail with bar snacks that masquerade as mini meals, this is the spot du jour. The street gets its name from the overwhelming number of Zhangzhou people who left Amoy in China to settle in Singapore. One of the oldest streets in Singapore, it was developed during the 1830s under the watchful eye of Sir Stamford Raffles. Located in the central business district, each shophouse in the lane is at least 150 years old. Under Singapore law, changes to shophouse facades are not allowed, and the street retains an old world charm reminiscent of a romantic town at the cusp of modernisation stuck somewhere between an Asiatic beauty and colonial influence. The ambience of a modern drinking hole in a building rich with history makes the cocktail bars on this street a must-visit. Pioneers of Amoy, Jigger & Pony have been there for four years and counting, and is a firm favourite for people in the know. Expect classics done well and signature serves delivered by a proficient, knowledgeable and friendly team. Neighbours Sugarhall, are of the same founders and boast an impressive, and possibly the largest selection of rum bolstered by a delicious food selection, in particular their steaks. The biggest and rowdiest hype in recent months has been Employees Only (EO), an offshoot of the famous New York bar. EO (as it is affectionately called by its regulars) is touted to have singlehandedly revived the craft cocktail scene in the Big Apple. The owners saw the potential in our little red dot over four years ago during their visits, but only settled down when they found the perfect spot on Amoy Street. This is a bar that focuses on fast paced, high volume cocktails and is as proud of their food as they are their drinks. Ask for the steak tartare that is prepared at your table. 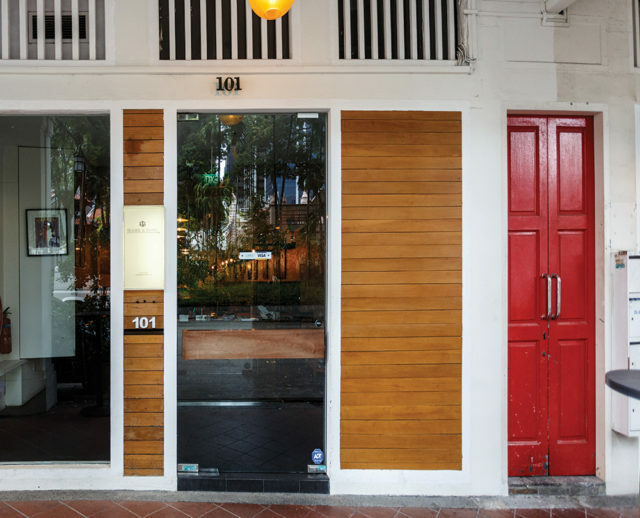 Albeit a street away, Telok Ayer is home to an interesting bunch of places to head to as well. One of my favourites is the unpretentious Bitters and Love, a no fluffs bar interested in good ol’ fun and good service. Ask for custom drinks served with quirky garnishes in unexpected glassware. Classic tunes from hip hop to top boy band hits pump out the speakers and make this hole in a wall a box to tick off on your cocktail bar list – if you are not at least tapping your feet or singing along to the songs in between sips of your drink, I’d be hard placed to recommend somewhere else where you’d have a good night out. In the afternoon, the bar transforms to a café called Free The Robot that sees a snaking queue from inside to the pavement during lunch. Two blocks down from Bitters and Love is My Awesome Café, an eclectic café whose owners just wanted a place of their own to hang out at. A place where nostalgic primary school plastic tables make for dining tables, and where drinks come in light bulbs. Not essentially a bar but a great place to fuel up and guzzle some beer before you hit the cocktails. P.S: A little bird also tells us that there is a new cocktail bar opening up on Amoy Street in September. Shhh!